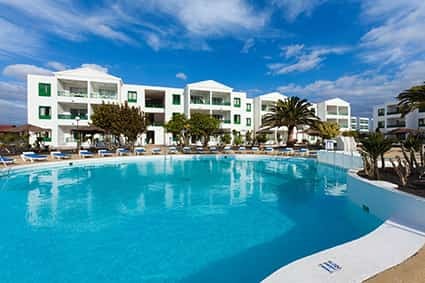 Situated in the popular tourist destination of Lanzarote, Apartamentos Costa Teguise Gardens enjoy a great location in a peaceful area of one of the island’s most attractive resorts: Costa Teguise. The family-friendly complex is just 800m from the beach, so is perfect for those in search of Atlantic sun, glistening blue sea and golden sand. Those preferring to soak up some rays from the comfort of the residence can do so at the large, inviting swimming pool where sunbeds are available. There’s a separate pool for kids to splash around in with new friends, and a Jacuzzi and sauna providing a tranquil place where guests can relax after a hard day sunbathing. Costa Teguise Gardens consists of spacious one and two bedroom apartments, well appointed in typical Canarian style. The apartments are complete with balconies and terraces for enjoying the stunning vista in private. Self-catering guests can make use of the Kitchen, while those who prefer to be catered for can enjoy the delicious cuisine at the buffet restaurant, and the all inclusive option makes for a fantastic value for money holiday. One bedroom apartments are tastefully decorated and are around 40m² in size. There is a separate bedroom with twin beds, as well as a living/dining area complete with sofa bed, desk, coffee table, free Wifi and TV. The sizeable en-suite bathrooms and fully-equipped kitchens are complemented by a terrace or balcony from which guests can relax in the evening sun. Perfect for families or groups of friends, two bedroom apartments provide around 60m² of space, well-appointed with traditional Canarian style furniture that offers a reminder of the Atlantic surroundings and free Wifi. Two separate bedrooms hold twin beds and a modern en-suite bathroom. The living/dining area hosts a sofa bed, desk and coffee table and the terrace or balcony provides a private viewing platform for the stunning surrounding area. 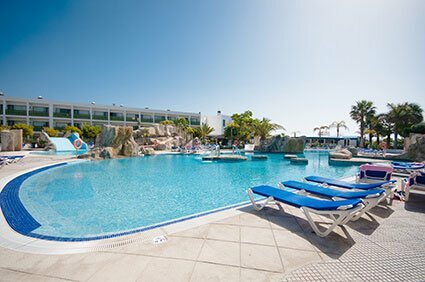 All inclusive at Blue Sea Costa Teguise Gardens is a great value for money option and includes buffet style breakfast, lunch and dinner plus a range of snacks served throughout the day. Drinks such as soft drinks, water and local beer, wine and spirits are all included in the package and available between 10.00 and 23.00. The Apartamentos Costa Teguise Gardens offers a buffet restaurant for those who prefer not to self-cater. Here, traditional Canarian cuisine is served alongside international dishes, so there’s a real variety of food on offer to suit all tastes. No holiday is complete without sipping cocktails at the poolside bar! The bar at Costa Teguise Gardens serves light meals such as burgers and sandwiches, as well as a wide selection of drinks. Apartamentos Costa Teguise Gardens is located on the popular Canary Island of Lanzarote. The area boasts gorgeous green spaces, fantastic beaches, and plenty of sunshine for holidaymakers who enjoy spending their days in warm climates. Occupying a great spot in the resort of Costa Teguise, the apartment complex is in a great location for guests to access the activities and amenities of the resort. Visitors in need of some retail therapy need only make a short journey to the resort’s centre, while beach lovers can enjoy the sand between their toes at Las Chucharas beach (free transport from the hotel for All Inclusive guests). Santa Barbara Tennis and Paddle Club is sure to keep active bodies entertained, while for night-owls, the fun carries on into the evening at various bars and restaurants within the resort. The area is a golfer’s paradise, too, with one of the Canary Islands’ top golf courses at Costa Teguise Golf Club. The club lies near the beach, providing stunning views of the ocean, and features an 18-hole course lined with palm trees, perfect for a day spent practising your swing.